On a recent trip out to Narrowneck plateau as I was taking photos looking out to the Jamison Valley, I got to witness the amazing Phantom Falls in action. Though it didn’t create the full waterfall looking apparition, it was still incredible. I really look forward to seeing more of this phenomenon for sure. This link explains how the right conditions are needed for the phantom falls to appear. This photo which I have entitled Into the Light is the latest edition of print for sale. Narrowneck Plateau has always been one of my favourite places to explore. 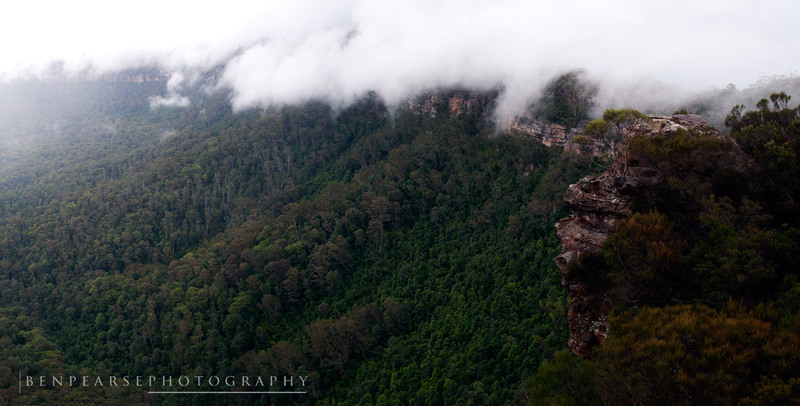 I grew up in the Blue Mountains and my oldest brother and I cut our teeth learning to rock climb in this area. It has been great to go back and explore and reminisce about our earlier adventures in this area. Coming back with a camera has been a really great experience and I look forward to spending more days wandering the area hoping to catch another glimpse of the Phantom! I heard about it and found this fascinating ! Gorgeous capture as usual Ben ! !